Halloween themed pottery and dishes by The Weed Patch! We have black, orange, candy corn, spiders, and more in mugs, plates, serving dishes, salt and pepper shakers and other great things by Tag, Park, Design Design, Ganz, and more! 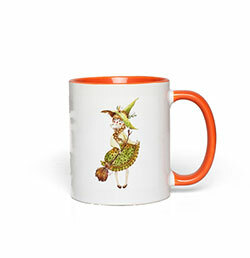 Enjoy a hot cup of coffee or apple cider this fall season with mug, featuring watercolor artwork of a sweet autumn inspired witch girl with her broom! Betty's Kitchen Mixing Bowl, by Tag. Mix it up in the kitchen with this fun bow, perfect for food prep, serving, or display! 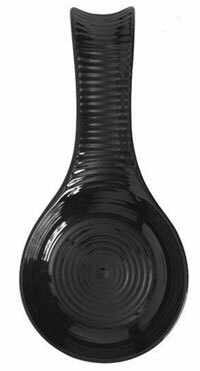 Has a stylish fluted design that makes the bowl easy to grip, shiny glaze in black, plus a white interior and rim. Heavy-duty pottery in solid black, with a hand-thrown look, deep sides, and ridging. Versatile black color mixes and matches with a wide variety of decor styles. Microwave and dishwasher safe. This is for the Dinner Plate. Measures 11 inches. Other pieces also available! 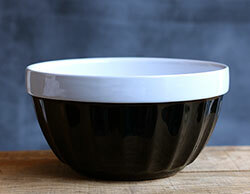 Blackstone Cereal Bowl, by Park Designs. Heavy-duty pottery in solid black, with a hand-thrown look, deep sides, and ridging. Versatile black color mixes and matches with a wide variety of decor styles. Microwave and dishwasher safe. This is for the Mug. Measures 4 x 4.25 inches. Other pieces also available! Blackstone Spoon Rest, by Park Designs. Heavy-duty pottery in solid black, with a hand-thrown look, deep sides, and ridging. Versatile black color mixes and matches with a wide variety of decor styles. Microwave and dishwasher safe. This is for the Spoon Rest. Measures 1.25 x 9.5 x 4.5 inches. Other pieces also available! 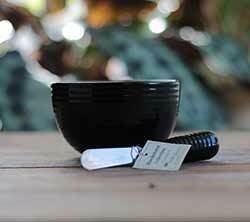 Heavy-duty pottery in solid black, with a hand-thrown look, deep sides, and ridging. This is for the Dip Bowl/Spreader Set. 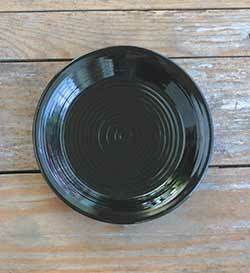 Heavy-duty solid black dishes, with a hand-thrown look, deep sides, and ridging. Salad sold in sets of two (2) plates. Blackstone Cereal Bowl, by Park Designs. 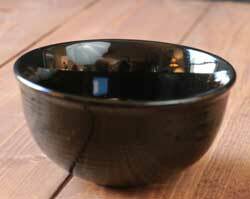 Heavy-duty pottery in solid black, with a hand-thrown look, deep sides, and ridging. Versatile black color mixes and matches with a wide variety of decor styles. Microwave and dishwasher safe. This is for the Cereal Bowl. Measures 3 x 6 inches. Other pieces also available! 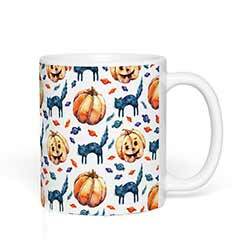 Enjoy a hot cup of coffee or autumn apple cider in this fun Halloween mug, featuring watercolor artwork of black cats, pumpkins, and more! Available in your choice of two sizes - 11 oz, and 15 oz. 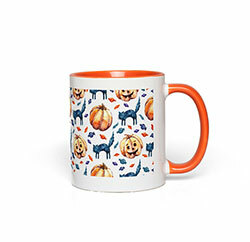 Enjoy a hot cup of coffee or autumn apple cider in this fun Halloween mug, featuring watercolor artwork of black cats, pumpkins, and more! This version is orange on the handle, rim, and inside. Eyeball Salt and Pepper Shaker Set, by Grassland's Road. Silly bloodshot eyeball salt and pepper shaker set, with a black, orange, grey, and white striped tray. Measures 2 x 3.5 x 2 inches. Part of the Monster Mash Collection. Ceramic. Photo courtesy of Grassland's Road. 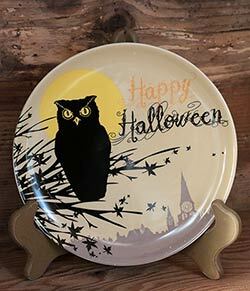 Halloween Owl Plate, by One Hundred 80 Degrees. 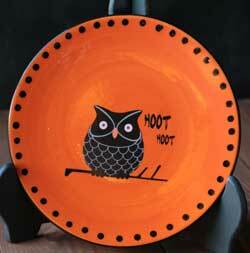 Orange ceramic salad-sized plate with black owl image. Measures 8 inches in diameter. Paper bowls printed with water-based inks in a colorful Halloween silhouette design of scarecrow, Jack O'Lanterns, and crow. 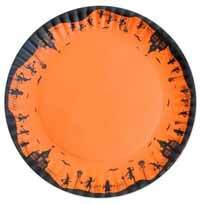 Paper plates printed with water-based inks in a Halloween silhouette design of a haunted house, with scarecrow, Jack O'Lanterns, and bats. 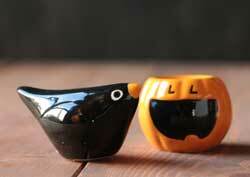 Halloween Pumpkin Salt / Pepper Shaker Set, by Tag. Stackable Jack O'Lantern and black hat earthenware salt & pepper set shaped. Measurements: Hat is 2.125 x 2.375 inches; Pumpkin 1.75 x 2.125 inches. Features a spooky top hatted skeleton silhouette against a vintage newspaper background. Features a spooky witch silhouette against a vintage newspaper background. Border is elaborate old-fashioned swirls against a black background. 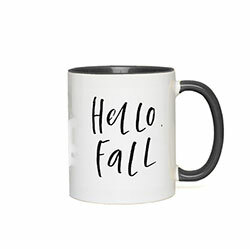 Enjoy a hot cup of coffee or autumn apple cider in this autumn season and proclaim your love for fall with this Hello Fall mug! Features a hand written lettering style, with black accents. 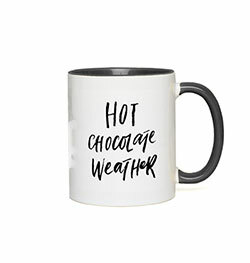 Cozy up with your hot beverage of choice this autumn season and proclaim your love for fall with this Hot Chocolate Weather mug! Features a hand written lettering style, with black accents. Jack O'Lantern Halloween Appetizer Plate, by Tag. 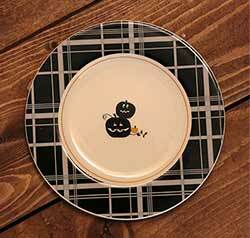 Earthenware appetizer-sized plate with painted black and white plaid border, and black silhouette decal image in the center. Decal images have small touches of orange, and there is a thin orange stripe on the inside border of the plate. Measures 6.875 inches in diameter. Dishwasher/microwave safe. 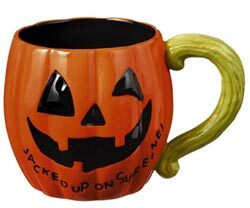 Jacked Up Halloween Mug, by Grassland's Road. 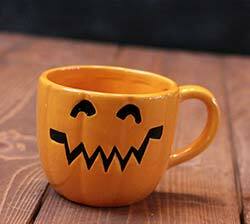 Pumpkin-shaped ceramic mug with debossed details of a jack o'lantern face, and pumpkin vine stem. Reads: "Jacked up on caffiene." Inside of mug is black. Measures 4 x 5.5 x 5.5 inches, 12 ounces. Microwave/dishwasher safe. Enjoy all the pleasures of the autumn season with Keep Calm and Love Fall mug. Great for a teacher or student facing "back to school" stress! Features a hand written lettering style, with black accents. 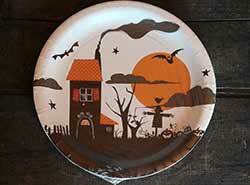 Melamine Halloween Platter, by One Hundred 80 Degrees. 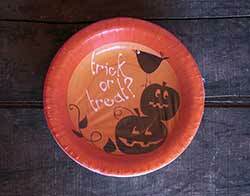 Fun party plate with the look of paper, but is sturdy, reusable, shatter-proof melamine! Black and orange with silhouette images. Measures 16 inches. Hand painted earthenware stackable salt and pepper set with embossed features, shaped and painted like a Jack O'Lantern and raven! 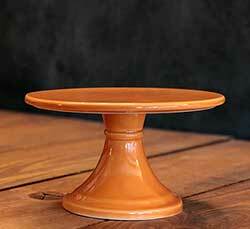 Perfect for small desserts, a centerpiece, or candle plate! Pumpkin orange color, great for fall decor. 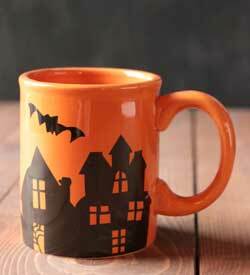 Pumpkin Mug, by Tag. 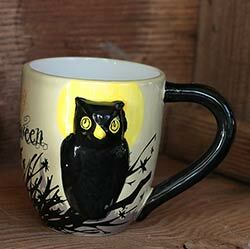 Hand painted earthenware mug with embossed features, shaped and painted like a Jack O'Lantern! Measures 3.5 x 4 x 5.5 inches. 12 ounce capacity. Coordinating platter, plates, and more also available! Spiderweb Glass Platter, by Tag. Glass plate with spiderweb design and scalloped border. Measures 12 inches. Food safe. 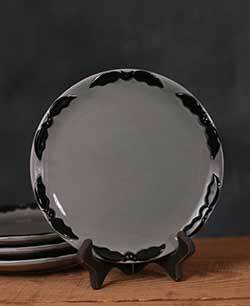 Hand-wash.
Grey ceramic appetizer/snack-sized plate with embossed bat design around rim. Part of the Spooky Party Collection. 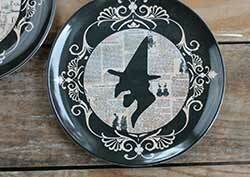 Spooky Halloween Witch Glass Plate, by Carson Home Accents. A Dan DiPaolo design. 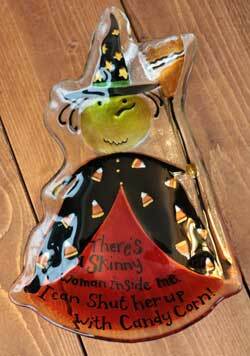 Reads: "There's a skinny woman inside of me; I shut her up with candy corn!" Measures 7 x 11 x 1 inch. Food safe. 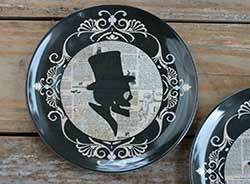 Spooky Party Crow Paper Dinner Plates, by Tag. 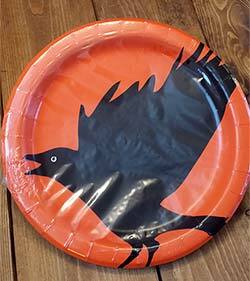 Paper plates printed with water-based inks - a flying crow on a harvest moon orange background. Use with hot or cold foods. Odorless and environmentally safe. Cello wrapped. 8 per package. Measures 10.25 inches in diameter. Part of the Spooky Party Collection. Coordinating items also available! Spooky Party Halloween Glass Plate, by Tag. 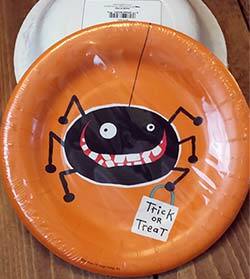 Add a whimsical touch to your halloween party decor with this fun plate! 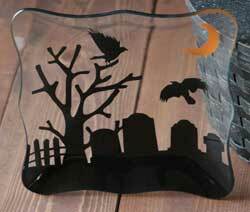 Features a graveyard, ravens, and crescent moon! Orange Spooky Party Mug, by Tag. Has a haunted house and bat silhouette against an orange background. Measures approx 4 x 3.375 inches. 12 oz capacity. Microwave and dishwasher safe. 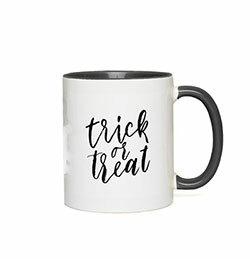 Enjoy a hot cup of coffee or autumn apple cider in this Halloween season with this Trick or Treat mug! Maybe someone will even give you candy! Features a whimsical spider on an orange background. Odorless and environmentally safe.